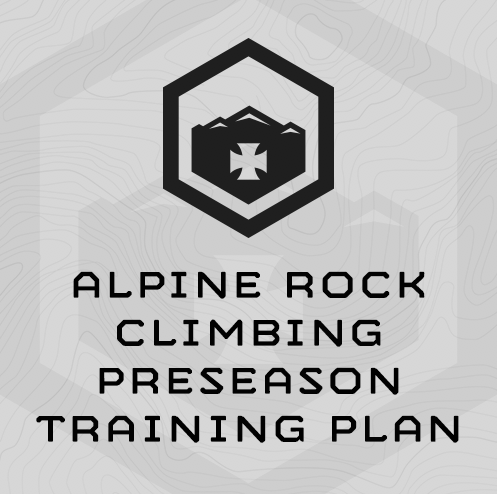 This 6-Week training plan is sport-specifically designed to prepare athletes for traditional alpine rock climbing days or trips which include a long, steep approach, trad rock climb, and walk off or rappel descent. The plan assumes you’ll train 5 days/week for 30 total training sessions. This programs trains your “mountain chassis” – the legs, lungs and core required for hiking up and down steep inclines under load. It also sport-specifically trains your forearm strength, grip strength, and rock climbing technique. Pick 4 Routes 3 V levels under your ability (a V-4 Climber would use V-1 Routes). Record your routes. (1) 550x Step-ups for time in 30# pack. Pick 3 top rope routes you can onsite climb (A 5.13 Climber would pick a 5.10 or .11 route, for example). Record your route names. (2) Rest 15 minutes (or, if you have a partner, they’ll do (1) above). (4) Rest 15 minutes (or, if you have a partner, they’ll do (1) above). I live in Kansas City so any mountain activities I want to do now are legitimate trips. I take one “big” trip each year which means I want to squeeze the most out of every day I’m in the mountains. My trip last year was to the North Cascades and after some self-guided training to prepare, I got worked over… hard. This year I arranged for a trip to the Bugaboos. We planned for 6 days in the mountains if the weather agreed. With the cascades still fresh in my mind I wanted to make sure I was physically prepared to get the most out of this trip. I had been using your bodyweight training program and your SSD subscription sessions for a while with good results, so I decided to try out your alpine rock climbing plan. I completed that plan and then threw in the gym based stamina plan for good measure. Thanks to some stellar weather, we were in the mountains for 5 days. Only our last day got rained out. The promises made in your alpine rock climbing and gym based stamina plans were delivered. Most important I think was the mental toughness. The glacier was in miserable condition which meant a lot of added distance around crevasses and that demanded my full attention for long durations. I was able to perform at the top of my game for 5 consecutive big days. My partner (a regular trail runner and ultra-marathoner) is someone I’ve climbed with on multiple occasions and he was blown away at how fast I could cover the terrain big day after big day. He was so impressed in fact that he is going to start using some of your plans for his training. It was really exciting to see how well all the hard work in the gym translated to the trail/ridge/wall. Thank you so much for helping me get the most out of what precious time I have in the mountains. I am an SSD believer and I will be preaching the good word whenever the opportunity arises.